Benetton Essence Woman has a very sweet & tempting sufficiently bright & varied sound. Benetton Essence Woman 100ml. Eau De Toilette is an oriental sounding, flowery-fruity fragrance. The distinct aromas of sun-ripened peaches and citrus fruits, especially oranges and bergamot from Florida. Green, fresh freesia bring the feminine, flowery heart to unfold that gets lively accents of roses and jasmine. A sensual touch to wind down by wooded patchouli, vetiver and white musk enriched, rounds off the fragrance. The concept of paired flavors Essence of United Colors of Benetton is based on the style of Benetton, which mixes colors in a cheerful and colorful kaleidoscope. Both fragrances Essence of United Colors of Benetton placed in the semi-circular glass bottles, painted with rainbow colors. Women's gamma based on orange and pink, symbolizing femininity. 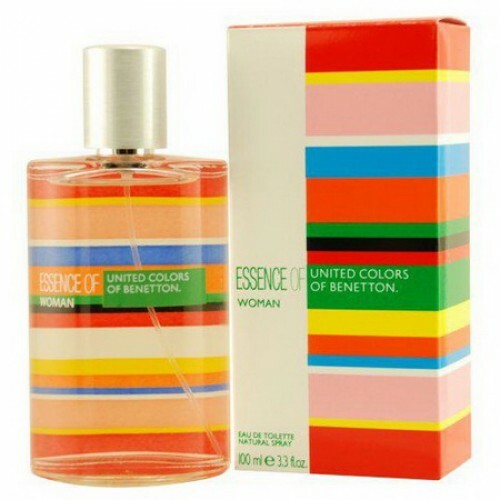 Female Essence of United Colors of Benetton Woman - floral-fruity fragrance with oriental undertones. This is a modern interpretation of oriental elegance. The composition begins notes sun-warmed peaches, oranges and bergamot from Florida. Fresh green floral notes complement the "heart" of roses and jasmine. Sensual loop consists of patchouli, wood, vetiver and white musk. Essence of Benetton for Women by Benetton is a floral fragrance for women. The fragrance features pink pepper, musk, jasmine, lily-of-the-valley and bergamot.